Kelowna-area athletes ran, jumped and threw to eight individual gold medals at the B.C. Athletics provincial track and field championships in Kamloops on the weekend. Aaron Stroda, 17, led the way with three first-place finishes while adding a bronze medal with a personal-best performance in the youth division (16 and 17 years old) javelin event. The Okanagan Mission Secondary School student started the provincial competition with a huge personal best in the hammer throw, a discipline he took up just 15 months ago. His longest throw of 57.30 metres was almost 4.5 metres better than his previous best. “I was expecting to throw over 55 metres and was very happy to pick up my first gold early on in the competition,” said Stroda, adding he felt he was in “great shape – both physically and mentally” going into the weekend. Stroda, ranked second in the nation in the youth division in shot put, came close to his personal best (16.33) with a gold-medal toss in Kamloops of 16.13 metres – one metre better than his closest competition. While his throw of 48.76 metres in the discus was well off his PB of 50.57 – making him the top-ranked thrower in the country – the distance was good enough for his third gold of the B.C. championships. Stroda’s bronze medal in the javelin came on a throw of 51.36 metres. He is third in the nation with a personal-best distance of 53.80. Three members of the Okanagan Athletics Club won gold competing against the top track and field athletes in the province. B.C. decathlon champion Rostam Turner took gold in the junior boys (18-19) discus event with a throw of 42.37 metres, while Sean Bergman finished first in the midget (14-15) 1500 steeplechase. The OAC’s Keely Watts-Watling, still in training for the Canadian Legion junior heptathlon championship in Langley next month, recorded a leap of 5.52 metres to win the junior long jump in Kamloops. Keefer Joyce of Kelowna, running as an unattached, earned another gold for the Central Okanagan. He took top spot in the 100 metres with a time of 10.76 seconds. Cowichan News Leader – Cowichan’s Chicago Bains has done it again. During provincials action, the local track sensation smashed a 1986 provincial 80-metre hurdle record of 11.50 seconds with a personal best of 11.42. “I cannot express in words the magnitude of this sprint race record she has just established, it leaves me speechless,” said coach John May in an email on the provincial meet in Kamloops July 19-21. Cowichan product Taryn Smiley also knocked socks off, winning both the 100 and 200 metres races. “For the 15 year old midget-aged athletes and the 16/17 year old youth athletes, it’s a trial meet to get on the BC Teams that will attend the Legion Youth National Track and Field meet in August this year in Langley BC,” explained May on the weekend event that saw participants drenched in extremely hot weather. Bains’ record breaking victory also has a cool story behind it, the coach said. May said he was shocked and speechless when the final time, 11.42, was posted. Bains amazed folks again Sunday with her 200m hurdles race, taking top spot with another provincial record finish of 27.60, just shy of her 27.53 personal best she attained two weeks ago. May has coached Smiley for one season under her second claim club, the Comox Valley Cougars. “On Sunday in the 200m she again won her heat in convincing fashion and in the final, ran the most stunning race I have yet seen her run and with the team standard set at 25.45, Taryn exceeded that standard by running 25.39 in the final. “This certainly gives her a good shot at being on the BC Team as well,” said May, noting the team will announce its lineup in the next few days. 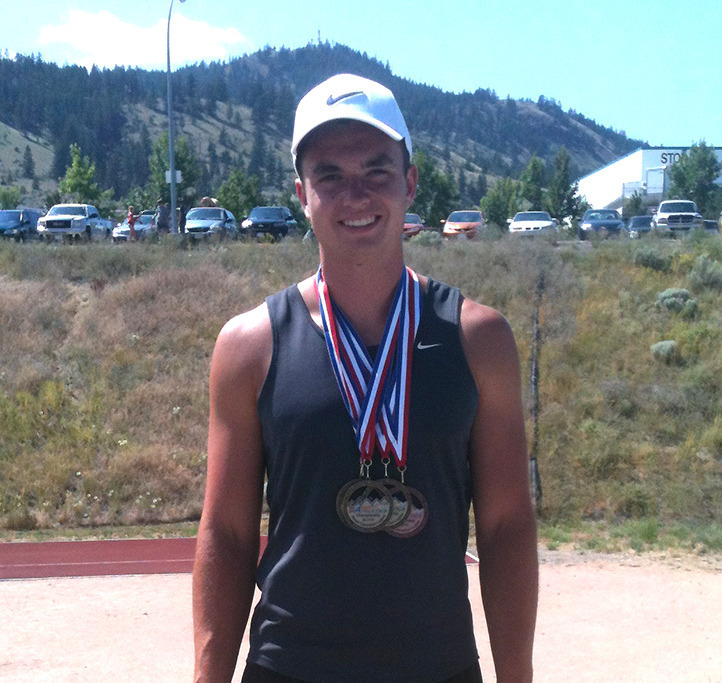 It was a weekend to remember for Kelowna’s Aaron Stroda who topped all youth competitors with four medals at the B.C. Track and Field Championships in Kamloops. The 17-year-old OKM student won gold in hammer throw, shot-put and discus, and a bronze medal in javelin. In the hammer throw, a sport he only took up 15 months ago, Stroda improved on his previous best mark by 4.50 metres, to 57.30m. “I was expecting a throw over 55 metres and was very happy to find quickly into the competition with my first win of the day,” said Stroda. On Day 2, Aaron secured a bronze medal in javelin (51.36m), then finished the weekend off with his third gold medal win—this time in discus with a toss of (48.76m). Prince George, B.C. – Prince George Track and Field Athletes earned 13 medals (1 gold, 3 silver and 9 bronze) at the BC Track and Field Championship Jamboree in Kamloops. 15 year old Keiran Leboe led the way with a gold in the hammer throw and bronze in the shot put, javelin and discus. Emma Balazs captured a pair of silver medals, finishing second in the women’s 18-19 year old 2000 metre steeplechase and second in the 3000 metre run. Teammates Shelby Jansen and Lauren Mathewson wound up second and third respectively in the women’s 14 year old 200 metre dash. Jansen also picked up a bronze in the 300 metre dash. In other PG results: Ryan Gaiesky picked up a pair of bronze in the men’s 15 year old triple jump and 100 metre hurdles. Carlee Campbell took the bronze in the women’s 16-17 year old high jump and Emma Floris was third in the women’s 15 year old 100 metre dash. 16 PG Track Club members participated in the meet for athletes aged 14 and older. More than 500 athletes are expected to compete in the B.C. Track and Field Championships Jamboree at Hillside Stadium this weekend. The provincial championships, which run Friday, Saturday and Sunday, are for athletes ages 14 and up. There will be able-bodied and para-athletics as part of the competition, and scheduled to compete are B.C. athletes who have competed in Olympics, world championships and university championships. Among the national team members expected to compete is Abbotsford’s Mike Mason, a 2012 Olympian in the high jump. There are 11 athletes who recently competed at the world youth championships in Ukraine, along with four who competed at the World University Games in Russia. There also will be five 2013 Canada Summer Games para-athletes. Kamloops hammer thrower Kibwé Johnson, who competed for the U.S. at the London Olympics, also is scheduled to compete — his competition includes Kamloops throwers Nolan (Trey) Henderson, Adam Keenan and Ryan Jensen. The 18-19 women’s hammer throw will include two Kamloops women — Breanna Derker and Samantha Hayes. Among the other Kamloops athletes scheduled to compete are Avery Marshall (15-year-old 100 and 200 metres); Alana Giesbrecht (16-17, 200m); Soleiya Tremblay-Mason (14, 800m and 1,200m); Kala Stone (18-19, 800m); Ian Polos (20-plus, 800m); Ty Fuoco (16-17, 1,500m); Kendall Fitzgerald (15, 2,000m and 1,500m steeplechase); Bryce Turner (15, 2,000m and 1,500m steeplechase); Faryn Brown (20-plus, 5,000m); Daniel Elke (18-19, 110m hurdles); John Saari (20-plus, shot put and discus); Mason Kereszti (18-19, javelin) and pole vaulters Alex Smith (16-17), Braden Derker (16-17), Emily Schultz (20-plus) and Spencer Allen (20-plus). The action starts Friday, 5:30 p.m., with 300m and 400m semifinals, steeplechase events and the 5,000m, along with triple jump and hammer throw finals. Johnson, Henderson, Jensen and Keenan are to compete in the men’s hammer final at 7 p.m.
Saturday’s competition will begin at 7:45 p.m., and run all day until around 5:50 p.m. On Sunday, the races start at 8:30 a.m., with the last event to begin around 4:20 p.m.